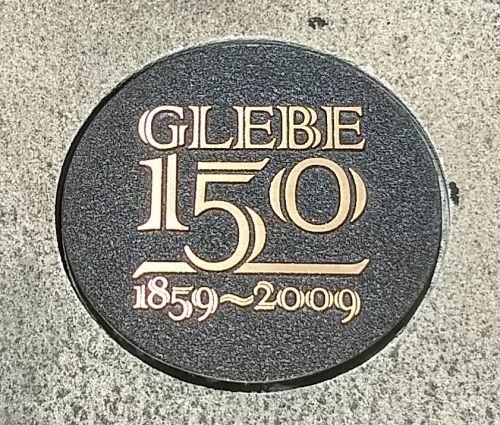 Notes: On 2 August 2009 residents of Glebe gathered to celebrate 150 years of Glebe's history by the ceremonial burial of a time capsule. Robyn Kemmis was the MC; Lord Mayor Clover Moore gave the address. On this day, Sunday 2nd August 2009, this time capsule was buried here in Glebe Place, in a ceremony carried out by Clover Moore MP, Lord Mayor of Sydney. To celebrate the richness of life in Glebe, items have been collected for inclusion, that reflect the intrinsic qualities and character of the Glebe community, with the idea of communicating life at that time with Glebe residents in 2109. The time capsule is to be exhumed in 2109.